The effectiveness of every content SEO strategy largely depends on the quality of the keyword research that has been executed. If you optimize for words that nobody searches for, you won’t be found. If you optimize for terms that are much too competitive to rank for, you won’t be found either. In this post, I explain why you should start with keyword research and how you can make sure your keyword research generates optimal results. Every audience uses specific search terms. It’ll make quite the difference whether you’re selling hair products for teenagers or for middle aged housewives. These two target audiences are likely to use different words to search the internet. Sometimes a marketing department decides to give their products a certain name. That can be a smart marketing decision. It can be a way to make people remember your product. For example, you don’t sell wine but you sell ‘adult grape juice’. Or, you don’t rent out vacation homes, but ‘vacation cottages’. Be aware that very few people search for ‘adult grape juice’ or ‘vacation cottages’. If you optimize your text for these terms, you’ll probably rank well on these specific terms. However, you won’t generate a lot of traffic with these terms and you’ll miss a large part of your potential audience. For SEO purposes, you should always optimize a text for the words that are used most often by your audience. You’ll have to get into people’s heads for that. Use tools like Google Trends to find out what people are searching for (and which terms they are not using). You’ll never instantly rank in niches you’re no expert in. When you’re just starting out in a certain field, optimizing for the most highly competitive keywords is not going to work. You won’t be able to rank on those terms. If you’ve just launched a site with beautiful new vacation homes in the South of Spain, you shouldn’t aim to rank for ‘vacation Spain’ at first. Find your niche and go for less competitive (and more long tail) search terms like: ‘luxurious vacation home Costa Blanca’. Once you’ve started ranking and attracting traffic on these long tail keywords, you’ll be able to aim for some more head terms as well. 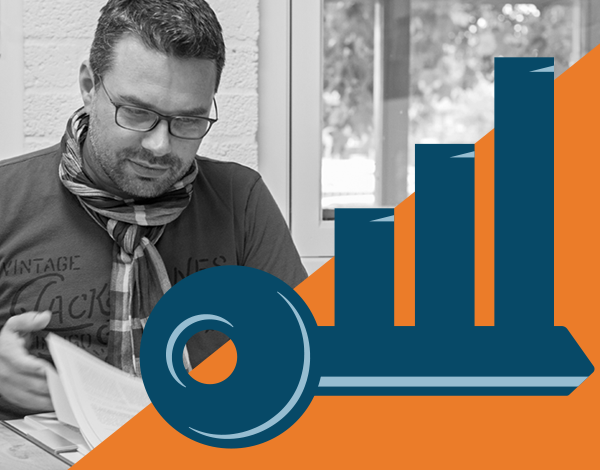 Yoast SEO helps you to optimize your content for a specific focus keyword. In Yoast SEO you can enter a keyword and if you optimize your post or page well, you get rewarded with a green bullet. Whether you’re going to generate traffic to your site largely depends on the focus keyword you choose. Words that aren’t used by your audience will perhaps be easy to rank for, but won’t generate a lot of traffic. On the other hand, choosing very popular keywords and trying to rank in a highly competitive niche is hard. You don’t just get there by getting a green bullet in Yoast SEO. Sadly, a green bullet in the SEO analysis of Yoast SEO doesn’t guarantee traffic. If your focus keyword is badly chosen, you probably won’t generate that much traffic with it. That’s why the most important step in your content SEO strategy is to execute proper keyword research and to make smart decisions on which keyword to tackle first. At Yoast, we’re currently developing new metrics to better assess the readability and the SEO score of your text. In the latest update of Yoast SEO Premium, you’ll find Yoast Insights. You can see which words are most prominent in your blog post. These words can be a great source of inspiration for your keyword research. Perhaps you could write another post about one of these key phrases. Perhaps you could try and optimize this current post, adding one of these phrases to our multiple focus keyword functionality box. 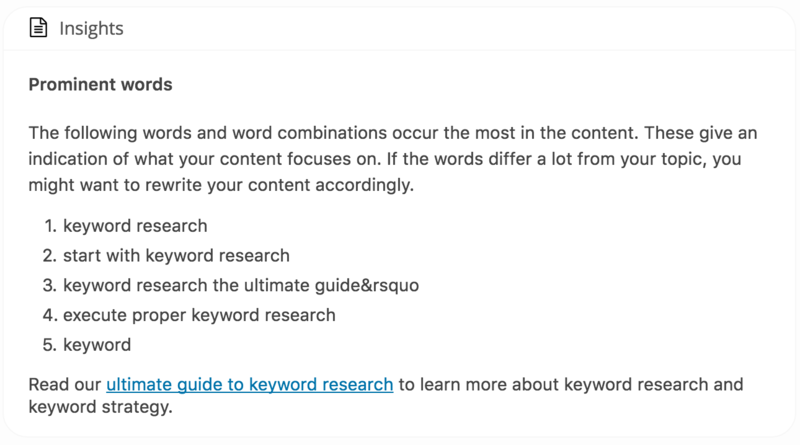 As long as you won’t forget to start with keyword research and focus on the words you want to be found for most, Yoast Insights can provide useful additions to your keyword strategy. Get help to start with keyword research! At Yoast, we do our very best to help you optimize your site for the search engines. Keyword research, however, is something you’ll have to do yourself. But we can help you to start with keyword research! Our SEO copywriting training, contains a module about keyword research. In this module, you’ll learn how to execute proper keyword research. As part of this module, you’ll have to complete an assignment in which you’ll execute your very own keyword research. You’ll receive personal feedback afterwards. From now on we’ll offer this module (including the assignment, and some extra material) as a separate course as well! Check out our Keyword research training for more information.